These adorable brother and sister Shiba-Inus belong to Carolyn and Larry Brick. Both dogs are Hearing Dogs. Takao, the black male, is partnered with Larry and Tiki. The red sesame female is the partner of Carolyn. 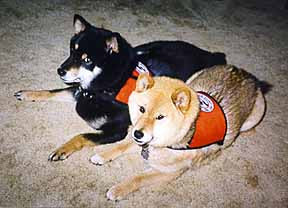 They both wear orange ID Cape dog vests in XSmall, and have one of our "Please Don't Pet Me" working dog patches sewn onto the top center of their capes.